This book is every bit as captivating and enchanting as you might hear. I've seen people discussing it for months now, sharing excitement and desperation for it. I personally had no intentions of reading the book, because I'd seen people compare it to Sarah J. Maas's ACOTAR, and I had way too many issues with ACOTAR to want to read something similar. But this fae book was incredibly different and not at all anything like ACOTAR. I hate SJM's books but I highly recommend this one, either way. Don't let comparisons fool you! They work for some, but not for others. This book needed no comparison, and can stand on its own without needing SJM or anyone else as a crutch. Isobel is an extremely talented artist, and does portraits of the fair folk. Her Craft of painting portraits is incredibly well-known, and fair folk flock to have their portrait done. One day, the autumn prince returns after hundreds of years of being away from Whimsy. When Isobel draws his portrait with sorrow in his eyes, she doesn't realize that this is a grave error - to draw human emotion on a fair folk. This is a weakness that the autumn prince does not need. So he spirits her away to take her to the autumnlands to stand trial for her crime. But they are chased by the Hounds of the Great Hunt, sent by the Alder King. What's more, Rook and Isobel fall in love, which breaks to Good Law that humans and fair folk are forbidden to fall in love. Isobel must sacrifice her life or Rook's, or they both must die. The author's writing is so lovely! It was a pleasure to read this book. There are some books in which you don't really notice anything special about the writing, or you definitely notice the flowery writing, or the clunky, choppy writing. I took note of the smooth, whimsical writing of this book. There is a lush quality to the writing, which I didn't necessarily expect. At the same time, the writing wasn't distracting or too overdone. I got swept into the story and I was hooked. From start to finish, I was in no danger of setting this book aside. I couldn't wait to see what Rook and Isobel would do next, what they would bicker about next, what Rook would misunderstood next (a lot of human mannerisms went straight over his head). And of course I wanted to see where the story was going - because the conflict switches several times, in order to get to the big picture (which isn't revealed until the very end). In any case, the author kept the story incredibly interesting and engaging, even if the subject matter was slightly dark and not happy-go-lucky. I love how seamless the world-building is - how I immediately accepted the way things were. Everything from Craft to the fair folks' strange ways to the weird rules about human Craft... once you get a few pages in, all of these things seem commonplace, meaning I didn't question any of it. Humans living among fair folk? Sure thing. A brilliant painter commissioned to paint fair folks' portraits in exchange for enchantments of her choice? Makes sense. Rogerson does a superb job with crafting the world-building. Not for a second did I question the world-building, or fail to see or understand something. More than once, I was vividly imagining this or that - whether it was the rotten fruit, or the oak trees, or the honeysuckles. Isobel is a character that I connected with very quickly. She is dedicated to her Craft and she is a diligent and determined hard worker. Everything she does is for her family, as well as she loves losing herself in a new portrait. Working with the fair folk is very taxing, but her Craft is who she is. I loved how feisty Isobel was, underneath her polite exterior. She has impeccable manners when it comes to the fair folk, but it is Rook that makes her forget her courtesies. Ahh, Rook. Rook is an enigma, and yet he is so clearly defined. He is the mysterious autumn prince who stopped coming to Whimsy hundreds of years ago, and now he is returning for some reason (the reason is given in the story eventually, don't worry!). Rook is unusually kind and understanding for a fair one, but he is also charming and ill-tempered too. Isobel thinks of him as arrogant and a little self-centered at first, but he is also selfless when it comes to her safety. He is very powerful and not to be trifled with, especially as a prince. Rook is my favorite type of male lead - powerful, a little arrogant, very concerned with the female protagonist's safety and comfort, somewhat alpha-y but not in a d**chebag way. He has hints of danger and seductiveness that makes you fall for him easily. This book takes place over the course of many weeks (especially in the beginning, as Isobel paints Rook's portrait), and so a lot of time passes, and the couple fall in love. Isobel has always felt something for Rook, but Rook was never trying to fall for her. They realize they love each other later on in the story and this isn't good, because it breaks the Good Law. Watching these two fall for each other was so cute and swoony, in subtle ways. There aren't many kisses or even physical interactions (arms brushing, holding each other, etc. ), but this book is still very romantic. Neither one of them really wanted to fall for the other, but in the end, it was inevitable. They are a beautiful match - especially with all of the bickering and how they still stick with each other. Both of them have many choices to leave the other and go back to their business, but they always find that they simply cannot do so (especially Isobel, who in all rights should have left Rook as soon as possible, to go back to her family). The climax is exciting and nail-biting - I wasn't at all sure how the book would end. I was so scared that there would be a heartbreaking, soul-crushing ending. BUT. I will say that the climax is extremely eventful, so don't skip to the end at any point. The ending is so lovely, so perfect for the story. Finally, a story involving fae that ends well (in my opinion). Bottom line? This book is definitely worth reading. It exceeded my expectations! And the ending is so, so good. I wanted more kissing, and potential steamy scenes between Rook and Isobel in general! I'm not saying ACOTAR-level stuff, but I definitely expected at least a little more kissing. I think my romance-related expectations were very high, and physical chemistry was high on my expectations list too. Especially with the mentions of a specific nightgown (seriously, all of the details were described very carefully - what did you expect me to think?). I highly recommend this book to anyone who loves sweeping, romantic fantasy. I don't usually enjoy fae-related books and I definitely didn't enjoy SJM's ACOTAR, so I was initially turned off by the idea of this book. I almost didn't even read this book. But I'm glad I did, because it was swoony and romantic and heart-pounding and put me on a roller coaster of feels. Did I mention that there is no love triangle or anything else to the romance, besides Rook and Isobel? Linear romance for the win! 4.5 stars. I'm still deciding if I should up or down, so I'm rounding down for now. I see why this book made it on the New York Times Bestseller's List. It deserves the spot and I hope it hangs out on the List for a while. I'm glad this book is a standalone (though I definitely wouldn't mind more Rook/Isobel goodness). I can't wait to read what is next by this author! I've seen a mix of possitive and negative reviews of this book and I really want to read it. Fae are totally my thing but seeing I've been hearing mixed things about it, it might go either way for me. Great review!! I think because it wasn't like the ACOTAR series that I didn't like it. Haha. 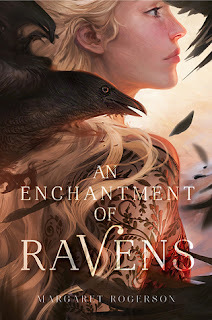 I was really hoping for an epic romance similar to ACOMAF and didn't feel that, which is why I was disappointed with this one. I have seen that readers who haven't read/don't like ACOTAR have more success with it though! So happy to hear that you enjoyed this one a lot! It's on my TBR so I will have to go buy it soon. I haven't read an SJM yet so I don't know if the comparison will bother me or not. The cover for this one is super gorgeous too. Great review! This book sounds good. I love when the author's writing is smooth and just grabs you in. Also, I love that the world building worked. Great review! I am going to need to check this one out. I am dying to read this book!!! I just came back online this weekend and everybody was talking about it. I'm so glad to know you liked it, too! And I'm so glad it's not like ACOTAR!